Son of Norman Mackay, of Park, Carloway, Stornoway. 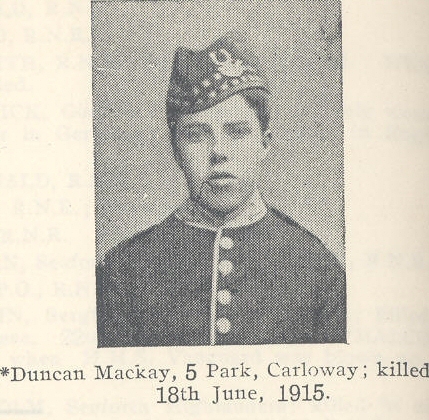 Duncan appears in the 1901 census aged 4, the son of Norman and Catherine (both aged 34) and brother of John (8) and Catherine (1). Wonderful weather. Comparatively quiet week, with exception of the usual shelling, which was particularly annoying along the canal after dark. The line taken over was pretty good. We've put a lot of work into it and improved it a great deal. On the left of our line at a small salient, the Germans have sapped forward and made a T trench within 25 yards of our trench. They are supposed to be mining or at any rate boring there. Exploded a small mine there just before we took over. Elsewhere, the trenches are about 300 yards apart. The Germans do not seem offensive and are consolidating their line as hard as they can. Several casualties during the week, mostly from shell fire, and some from bullets.